If you in Siem Reap for a few days you may get out from the busy town to see some of the beautiful Khmer countryside. Whether you have just one hour or whole day, Come and explore rural Cambodia with us ! Watch the sunset above rice fields while you are riding a quad bike along village roads of Cambodia. Cambodia Quad Bike is located in Siem Reap, not far from the Old Market. We offer unforgettable quad biking experience in Cambodian countryside. Come and explore off road tracks, rice fields, forgotten temples and life in local communities with our team of professional guides and mechanics. Cambodia Quad Bike caters for individuals, families, small groups and corporate events. All our bikes are fully automatic making them easy to ride and use. Watch the sun rising above rice fields while you are riding a quad bike along village roads of Cambodia. At arranged time we will send a tuk-tuk to pick you up from the hotel and transfer to the Cambodia Quad Bike office. In the morning we will send a tuk-tuk to pick you up from the hotel and transfer to the Cambodia Quad Bike office. No, you don't. You don't even need to know how to drive a car! Our 2013 series Polaris TrailBoss 330 cc quad bikes are very easy to learn, and riding instructions are given prior to each tour. IS THERE AN AGE LIMIT FOR QUAD BIKING? The minimum age is 18 as stipulated by our insurers. We have no maximum age, but due to the nature of riding quad bikes in an off road environment we would stress that participants need to be reasonably fit. Riders younger than 18 shall be accompanied by an adult - either relative/friend or one of our guides. 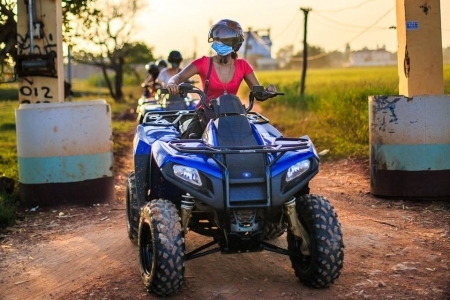 Quad biking is safe as long as you follow the full instructions and safety briefing given by our fully trained staff. All tours are accompanied by our guides, who will lead you through tracks and will assist during riding. If you disregard our guide's instructions, we will have to ask you to leave the tour. This is done for your safety and for the safety of other riders.